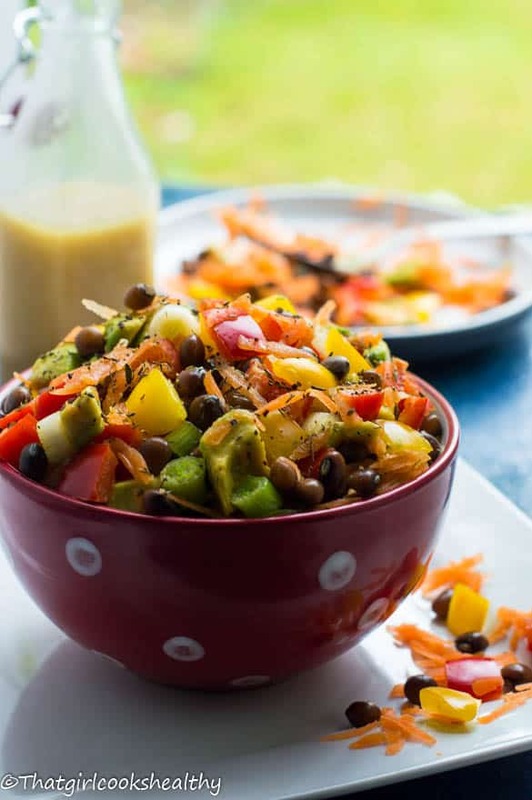 Pigeon pea Caribbean salad recipe – Taste of the tropics this lunch time with this vegan style legume salad with mixed vegetables and a sweet lime dressing. Now we’re really delving into some Caribbean flare with this pigeon pea salad. I’m sure you already know that I’d be on hand to provide the alternative name to gungo peas. In the Caribbean (English speaking islands) you’ll find these peas referred to as pigeon or congo peas. Growing up gungo peas (pigeon peas) would make a regular appearance on Sundays, why on the weekend you may ask? Well because we’d rotate between rice and peas (technically red kidney beans) or gungo peas and rice. There was always a huge divide in the house, some of us were partial to red kidneys while myself and co enjoyed gungo peas and rice. Mom would make a large batch of both variants and of course Charla was always there to gobble up the gungo peas. Aside from making gungo peas and rice on Sundays, we didn’t really incorporate them much in other recipes, at least not that I recall. Fast forward into the future I’m looking at creating inventive ways to mix old traditions with temporary flavours. 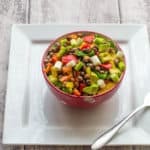 Actually, that is what inspired me to make this pigeon pea Caribbean salad – combining the old school with new school and you know what it totally works because you’ll get a taste of the Caribbean green salad that’s full of nutrition and optimal flavour. The Caribbean is notorious for a good ole salad some of you maybe familar with the infamous Caribbean potato salad, Caribbean, crab salad or even the Caribbean conch salad just to name a few. High in protein ideal for a calorie controlled diet. The fibre and protein from the peas help to stabilise glucose (blood sugar) which is highly crucial for metabolic disorders affecting the liver or pancreas, diabetes is a prime example. Avocados – Don’t be alarmed by the use of avocados, it won’t have any bearing on a calorie control diet, if that’s your concern. Avocados are enriched with omega fats which help to relieve inflammation and keep our brain cells rejuvenated along with maintaining a healthy heart. 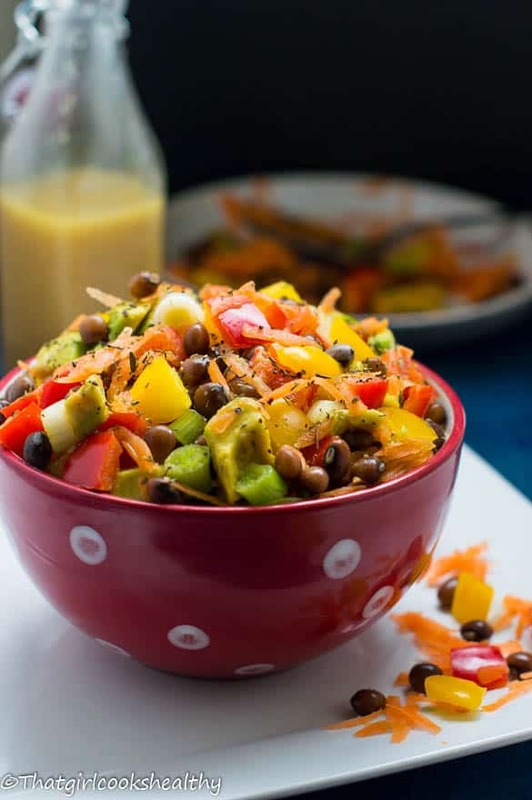 The Jamaican salad dressing – The true flavour of this legume salad comes from the dressing, don’t skip the dressing, it’s the epitome of goodness and in my humble opinion really heightens the taste of his Jamaican salad. Canned beans – another time save is to use canned beans as opposed to soaking and boiling the peas. This definitely saves on plenty of time and effort. I really want to make this legume salad, can I use something else if I can’t find pigeon peas? If obtaining pigeon/gungo peas is a problem simply use black eyed peas instead, but do make sure the peas are saturated in water only without additives. Where to buy pigeon peas? You can purchase pigeon peas from any Caribbean/Asian supermarket. Look for legumes labelled as either “pigeon peas” or “gungo peas” because the name is interchangeable. Other additional ingredients to add to your salad include………. 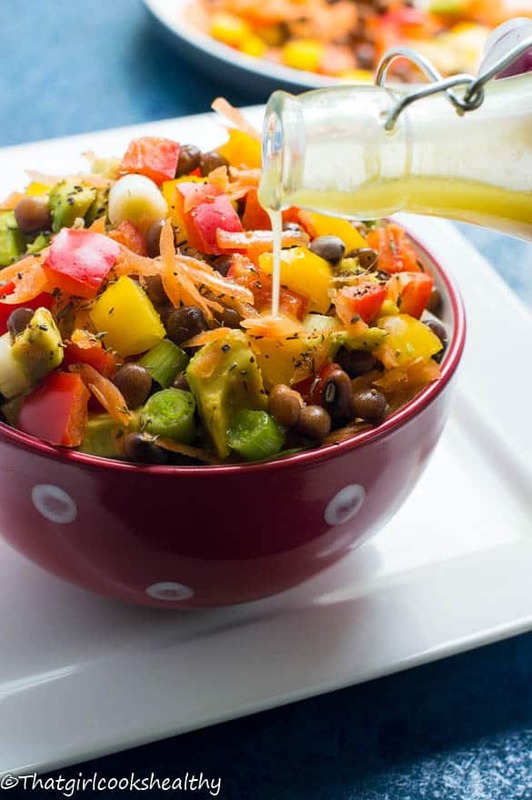 The above are some great Caribbean salad ideas that make for some great tasting vegan salads filled with that necessary vitamins and minerals that the body needs. Arrange all of the veggies in your favourite bowl or on a plate. Pour a generous amount of dressing over the entire salad and garnish with the dried thyme. Hey Brian, sorry to hear that. Pigeon peas are slightly bland with a subtle hint of nuttines and tender when cooked. You could try using red kidney beans as a substitute as they are more commercial and bare the same flavour/texture. This salad looks so good and the dressing sounds sublime. I can’t wait to try it! Thank you Mel. It’s very much vegan which is ideal for your dietary requirement. I’ve always had pigeon peas with rice, but I love the way this salad looks. So fresh! Thank you, you gotta try it! This is such a pretty salad! I’ve never cooked with pigeon beans before, but I’ll have to try! We eat a lot of beans in our household as they are soft and easy for kids to eat. The dressing on this salad looks so yummy. Must try! Pigeon beans are so nutritious but sadly highly underrated and that’s what inspired me to make this recipe. As you rightly pointed out they are kid friendly too and a bag of dried beans lasts a VERY LONG TIME. Amazing! I love how you’ve changed the traditional way of making pea salad! We always used mayo, but this looks so fresh and light. Going to try this one. Thanks Tina, you can always include mayo if you wish, but whatever you do don’t skip the dressing. 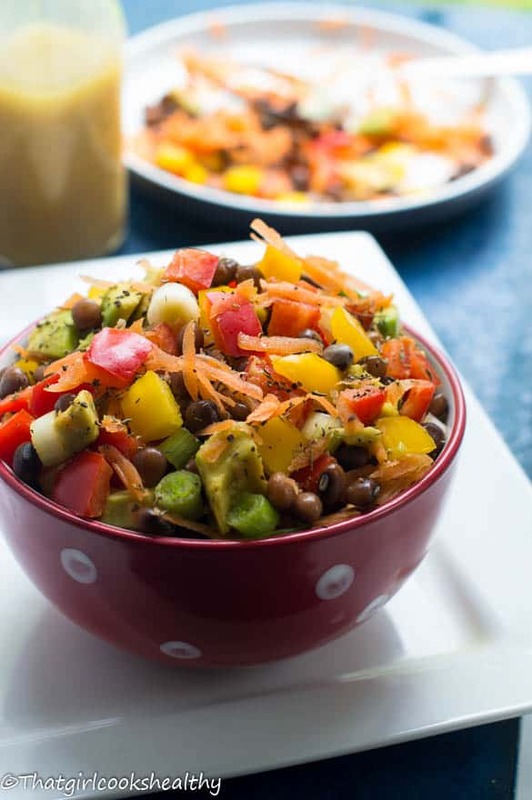 I love this pigeon pea salad recipe! Thanks for sharing. I’d like to talk to you about becoming a Chicory recipe partner, what’s the best way to reach you? Charla, I love gungo peas so much especially in rice and peas. Can’t wait to try your salad, looks yummy! Hi-5 for lovin’ gungo peas, I prefer them to red peas when making Sunday dinner. Charla, this salad is calling to me. I love this recipe. Thanks for sharing! Thank you Byron, yes it has your name written all over it. Whoa!! That salad looks good. We use pigeon peas in Indian cuisine too. Unfortunately, I dont find it easily in US. We do get the split pigeon peas though. Will surely try this recipe next time I buy pigeon peas. Thanks for sharing.. Thank you. It’s awful when you cannot obtain your cultural foods while living in the diaspora, try using red kidney beans if available. Hi Charla, wow I wish so much I’d grown up eating what you did, we pretty much lived on sausages and boxed fish! This sounds infinitely more interesting. Well, better late than never I guess 🙂 I am SO giving this a try. Pinned and shared! Thank you so much Lesley, Caribbean food is very much diverse I’m sure you had a few exciting things that you ate during your youth, don’t be so hard on yourself. Let me know if you like the salad. Thank you for such a beautiful comment. I’m so glad you liked the recipe, it’s my go-to during the summer months.